You can finally See Clearly Underwater – Without the high price of custom prescription goggles! If we don’t have the exact diopter number as your prescription, choose the one with the next lower number. For example: if your prescription is -2.75, choose the goggle with -2.50 diopters instead of -3.00 diopters. If you have a different prescription in each eye, choose the one with the lower number. For example: if the prescription of your left eye is -2.50 and right eye is -3.00, choose the goggle with -2.50 diopters instead of -3.00 diopters. These goggles are made with the same quality craftsmanship as the other Aguaphile goggles models. Just click the Aguaphile brand name on the listing above to see our other models and the RAVE reviews that they get. They are comfortable without being heavy, form a waterproof seal without leaving a deep indentation on your face. 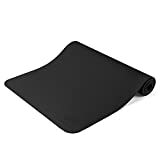 These are made with a very substantial, robust, High Quality Silicone which makes the eyecups very comfortable, good for sensitive skin. The lenses are Anti-Fog with UV protection, designed for wide peripheral vision. 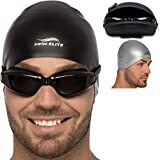 If you are ready to experience Great Feeling comfortable and also durable prescription swim goggles, go ahead and order! SEE CLEARLY UNDERWATER! – Without the high price of custom prescription goggles. Made with the same quality craftsmanship as the other Aguaphile goggle models. UNCONDITIONAL LIFETIME REFUND OR REPLACEMENT GUARANTEE! – If at Any Time you have a problem and want a Refund or Replacement, reply to the email we send, or click the Synergistic Visions company name above to contact us. SOFT AND COMFORTABLE! 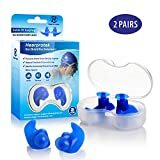 – They Feel Great – made with a very substantial, robust, High Quality silicone which makes the eyecups very comfortable, good for sensitive skin. LEAK-PROOF DESIGN! 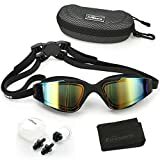 – 3 size adjustable nose bridge, adjustable strap, and soft and comfortable waterproof eyecup allow the goggles to fit to your face and head properly. SEE THE DESCRIPTION BELOW! – For how to pick the correct diopter number based on your prescription.